Its winter in the southern side of the world! This week I mainly stayed indoors working on my knitting, quilting and staying warm. My striped knitted stole I started a few weeks back has grown daily to 1.46m (58”). It’s knitted in stocking stitches, it has not been boring as you change colour after every two rows. I hope to finish this by next week. 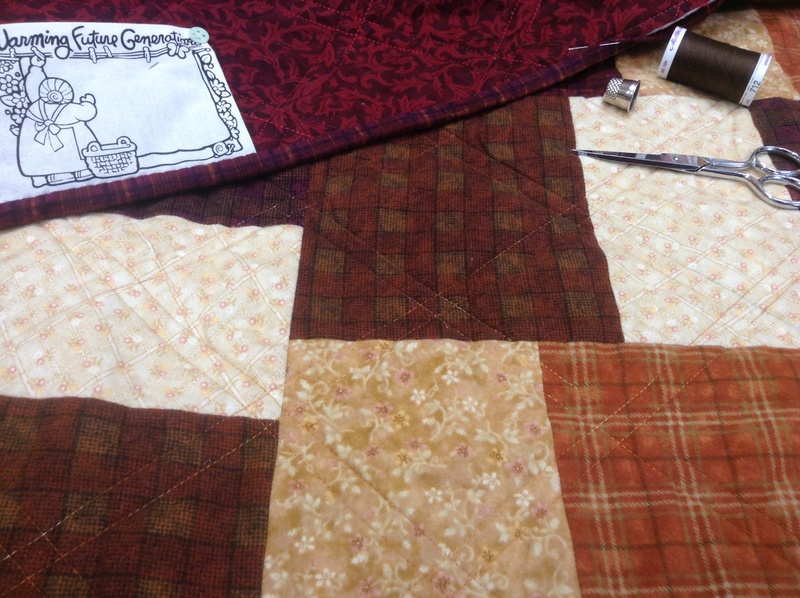 Sewing binding onto flannel quilt. I finished quilting the flannel quilt I started making for my youngest son. I am presently busy sewing on the binding by hand. I will share the pattern and the finished quilt with you soon. Dear Jane right side border blocks. I also pulled out the Dear Jane quilt I have been working on for the past 4 or 5 years. As the centre and the top border are done I decided this is the year to finish it off and I have to make at least 5 blocks a week! I really don’t know what possessed me to make this quilt! Some of the blocks take 1 whole day to make! Those of you on the southern side of the world, hope you are all staying warm, those on the north side, hope you have lots of fun! This entry was posted in Craft sewing, Knitting, Quilting. Bookmark the permalink. That knitting is lovely and warm in colour as well as texture. 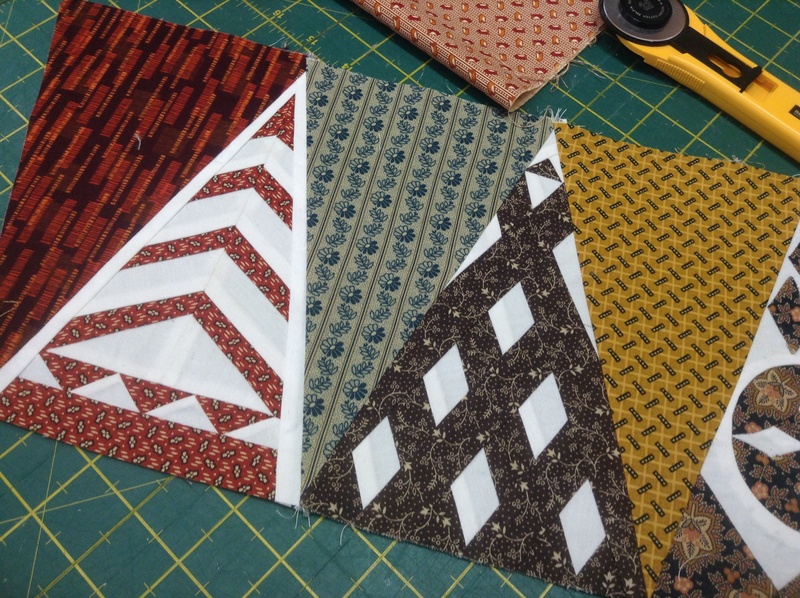 I do admire people who take on Dear Jane quilts – I’d never consider it because I like quick results! Mind you, the other side of my brain has a lot of patience for fiddly hand sewing, so I try and indulge them both! Wow that quilt does look like a complicated one, so I am sure you can appreciate the simplicity of the stole. (Not that I am saying it is easy, as I have no idea bout knitting. It is so lovely though I would love to knit….one day!!) Keep up the lovely work! Sorry I don’t know how I missed your comment! Thanks for your lovely comment! You will enjoy knitting, give it a try! I have seen that stole in previous posts, but I still feel happy every time I see its colourful cheeriness. Dear Jane! Ha ha! Welcome to my world. If you figure out what possessed you, let me know. It may be the same insanity that took hold of me. Very pretty stole! I haven’t knitted anything in a long while — not my favorite kind of needle work. I’m sure your son will be delighted to have that flannel quilt with the cold weather upon you now! Bless your heart doing a Dear Jane. I can definitely say I will never make one of those. I am too much of an instant gratification fan although I do like hand quilting, applique and the like. lol Perhaps I have a brain that cannot make up its mind what it wants to be??? lol Stay warm! Hope your winter is better than the one we had up north this past year. Dear Jane quilts are lovely to look at. It will be fun to watch yours hit the finish line. Would it make you any warmer to know our high is to be 95 F tomorrow. Reading about winter had a cooling effect here. Love the stripy stole. Such a beautiful blend of colours. Are you using up remnants of wool or did you buy yarn especially for this project? I have enjoyed knitted! Most of the yarns come out of my stash! I must confess I did buy 2 or 3 balls to add! The stole is absolutely gorgeous. There is something amazing about putting heaps of different colours together. I love the knitted stole, it looks so cozy. The Dear Jane border looks great-I’ve thought so many times about starting one but I have so many WIPs as it is. I know how it is! Dear Jane is a mission! Thanks for your lovely comment! The knitted stole looks quite nice. It will be very nice to snuggle around yourself when finished. Also that quilt looks interesting. Such precise work. Wishing you warm days in your cold time. Is that an oxymoron or what? I love those stripey colours. They caught my eye right away! I have enjoyed knitting it! Thanks for visiting! OK, Dear Jane is tedious. But your border triangles are beautiful! It will be worth the effort. Thanks Sherry! Hope you well? Hi Nikki, thank you I’m doing ok just going through some emotional times from some heart breaking news, Trying to stay busy with WIP projects, just about done with those will post them when done. Dear Jane’s are always a work in progress. Thanks for the pictures. Your work is beautiful. 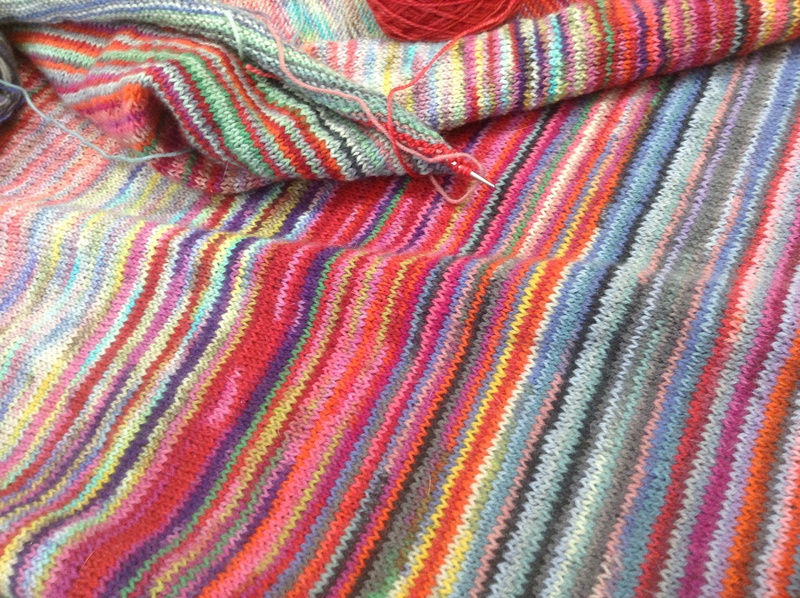 Love the colours in the knitting…. fantastic! Thanks for your lovely comment! I normal try to sew a bit during the day and knit at night in front of the TV!